Grand Newport Plaza, offers you and your guests the warmth of old-world Spain coupled with the elegance of Turnip Rose. If an outdoor wedding is your fancy, then the dramatic double stairway in front of the bell tower is the number one choice. As a special touch, nestled inside the ballroom are a beautiful bridal suite and handsome Tommy Bahama style groom's lounge. The indoor ballroom at the Grand Newport Plaza is truly a work of art. The elegant marble foyer opens to a beautiful room accented with rich floral and tapestry prints. The lighting is warm and inviting as is the large dancefloor set in the center of the room. There are even twinkle lights on the ceiling to help set the romantic mood. You can choose to dine "cocktail style" with unique food stations set in the room and adjacent Margarita Courtyard. Or if a more traditional menu is your wish, then why not select our elegant silver-dome Served Meal, complete with white glove Maitre'd service. Whichever you choose, our award winning cuisine will be sure to please both your palate and eyes. This place will appeal to any couple with great taste! 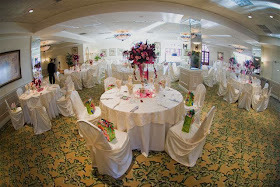 If you like things simple and easy and want an exceptional venue for your wedding this is one of the best in Southern California. Of all the food we've tasted at all the venues we've visited, the Turnip Rose consistently ranks among the very best. The venue is very clean, very modern without looking trendy. The staff is amazingly friendly and work their butts off making sure that everybody is having a great time. The service is exceptional, it truly ranks among the best white glove venues that we've seen, easily comparable to five star venues like The Ritz Carlton. This place isn't a low budget venue, yet they seriously earn their money. There is nearly an unlimited potential for great photography at The Turnip Rose. Just about any photographer can get okay pictures at this venue. However, to get stellar images takes skill and experience. There are often heavy hotspots of bright sunlight next to deep shaded areas created by the buildings. This can cut into an already tight courtyard making it a bit more challenging at times. Throw in a cocktail reception with guests floating around in the background and, yes, your photographer will need to come with another plan. Another factor is that The Turnip Rose is run like a Swiss watch. They like being on time. Thus, a photographer who works here should have strong photographic skills, good time management abilities, and a strong plan B ready to go at a moment's notice should they need to find another place to shoot. We found that it took us around three weddings to really figure out how to photograph this venue in a way that does the place justice. What made the difference for us was planning, knowing how this venue operates and working with the staff, not against them. An inexperienced photographer or one who isn't familiar with the Grand Newport Plaza is at a serious disadvantage compared to those photographers who are experienced, proficient, and prepared. There is a changing room upstairs that is perfect for portraits of the bride alone. (as illustrated in our demo album) The lighting is very dramatic, with ample amounts of available light spilling through the windows. There are a lot of nice areas to use in the courtyard. The exterior hallways make for some great portraits of the guys The fountains of course are amazing to shoot at, but we've learned one trick to make one even more interesting to use for large group shots. The long slightly spiral staircases make for some fantastic images as well If you have a courtyard ceremony it makes of a beautiful entrance. Inside the lobby is a great area to shoot down toward the bride and groom. There's a nice set of windows up on the third floor to use for romantics. Even the twinkle lights shot at night make for some impressive images. 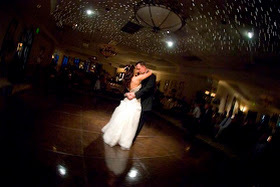 If you look below you'll find an image of the ceiling lit up during a first dance, again a good understanding of available light is important for a photographer. Since the time we wrote the original review of the Turnip Rose for this website we've done a wedding that was a daytime wedding at The Turnip Rose. The ceremony was in the morning, the reception was a lunch reception, and the bride wanted to use one of the local parks for her romantics after the reception was over. The reason we want to show it is because I've only been to the Turnip Rose for evening ceremonies and receptions. Of course the place is stellar at night, but even in the daytime it's still beautiful. See for yourself. There isn't a lot of distractions at the Turnip Rose. That being said, a photographer who has shot previous weddings at this venue is certainly recommended. There are a lot of great little spots to use, but to best utilize them, a photographer should have a good command of available lighting and flash photography. It took about three weddings before we really had a good feel for this place. The ceremony in the courtyard can be a little tight at times, but we've figured out how to make the best of it. During the cocktail hour the obvious spots to use for photography may have guests walking through the background. Again, this is where having a photographer in the know is a benefit. An under skilled photographer without much knowledge of this place won't do it justice. They may get some nice images, but not as good as a better photographer with prior experience with The Turnip Rose. This place can be amazing! It's a great place, the staff works hard, and the food is great. This should be good enough for a very positive review. One thing going in The Turnip Rose's favor is that we've worked at this venue a lot of the past eight or so years. They have yet one other virtue going for them, consistency. One of the reasons why a Ritz Carlton is a popular reception venue is that they can consistently perform. They have the staff, the drive and the vision to deliver a four or five star experience every time. In contrast we've seen some Country Club venues that also perform well for some functions and not so well on other functions. Inconsistency is fairly common. Often it depends upon the experience level of the banquet captain, and strangely enough their attitude toward the bridal couple that make a difference. We've seen The Turnip Rose in a variety of situations, including corporate events, and without fail they are amazingly consistent. We've never had a bad meal, had something run late, or heard one complaint from any client about The Turnip Rose. 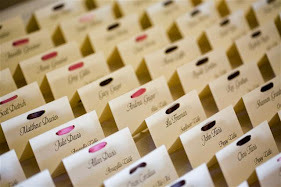 Consistency is important because you don't want a venues off day corresponding with your wedding date! The food at The Turnip Rose is exceptional. It consistently ranks as some of the best food you'll find at any venue in Southern California. Making food that is not only delicious but interesting is difficult to do for large banquets. That's why so many venues seem to offer the same meat, pasta or chicken options. The Turnip Rose serves banquet food that exceeds entrees we've tasted at higher end restaurants. If food is important to you, you will be very happy with The Turnip Rose. Your family and friends will be beyond impressed. Originally the Turnip Rose was this kinda nice place that had incredible food. But, over the years they brought the facility up to the same excellence as the food. A couple of other things to consider about The Turnip Rose is that it's located next to the First United Methodist Church of Costa Mesa. We've done ceremonies at this church and walked over to the Turnip Rose for the reception, nice and simple! As far as churches go it's above average. They do a nice service and seem to be friendly. The other thing to keep in mind is the location of The Turnip Rose. It's five minutes from the junction of the 55 and 405. It's proximity means that you can feasibly have a ceremony at a church in the western part of the Inland Empire, all of Orange County, and perhaps as far away as Culver City. When it comes to having a reception that people will have to drive to, the easier it is to find the less hassles you'll have with guests getting lost. Objectively, The Turnip Rose is simply a large room in an office complex on the outskirts of Newport Beach which ironically is nowhere near the water. Taking these things into account it has the potential to be just a very average venue. However, it's not, it's exceptional! There are a lot of things going in its favor. The facility manager for the Newport Plaza has been doing a good job keeping the property in great shape. Of course, the Turnip Rose has been reinvesting into their facility, and we've notice the improvements year after year. The Turnip Rose delivers upon your initial impression. Simple, elegant, breathtaking, professional and personable it's really a great venue! We give the Turnip Rose two thumbs up! Lifetime Images Loves Photographing Weddings at The Turnip Rose!!! As mentioned before, this venue can be challenging to photograph, but at the same time, it's one of the most rewarding venues to photograph for us. When we work here we know we have to be at the top of our game in order to make our images live up to our client's expectations. We love the challenge, and we love finding new places to utilize. It seems that we've paid our dues and we're now in a sweet spot where each wedding we photograph at The Turnip Rose is the best yet! A lot of high end photographers tend to like to cater toward The Turnip Rose clientele. Though many of them do have some fabulous work to show from this venue many of our clients found our work to be on par, and rates to be much more reasonable. That's what we call affordable excellence! Please take some time to look around our website and view our gallery, packages, raves, and 10 reasons why Lifetime Images is a great choice for wedding photography. Please feel free to drop us a note to see if we have your date available or call us at (877) 789-1655. Thanks you! Plug Video does the demo for The Turnip Rose. They have one that is different than the onethat they show at the facility. You really need to see it! It's stunning!